If you suffer from allergies like hay fever, you need accurate, reliable, timely information that allows you to consistently manage your allergy symptoms and take control of your life! 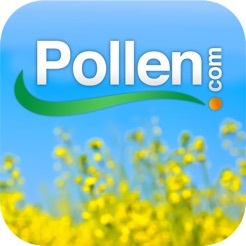 Newly redesigned Pollen.com's Allergy Alert App provides you with essential tools to do just that. 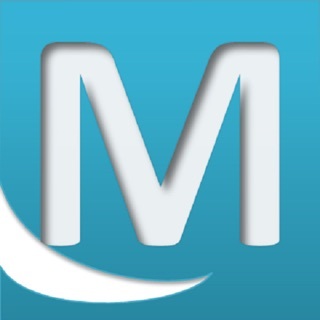 * Multiple locations can be checked instantly with the swipe of a finger. * Side by side 5 day up-to-date weather & allergy forecasts. * The only app to provide in-depth information about top allergens (Oak, Cedar, Juniper, Birch, Maple, Elm, Ash, Ragweed, Grass, Pigweed, Mulberry, Goldenrod and more) with detailed plant descriptions and images. * Dynamic screen background changes depending on allergy season: Tree, Grass or Ragweed. * Allergy diary to let you keep track of your symptoms and how you're feeling. * All the diary data can be later retrieved and printed as a chart or a calendar on My Pollen.com. 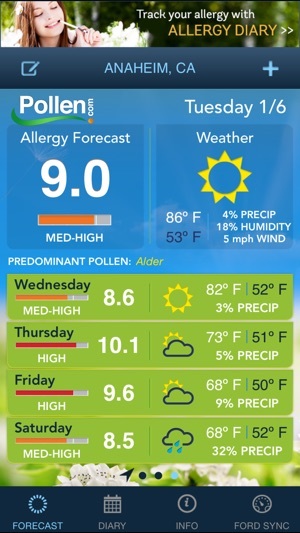 Bring allergy information from Pollen.com to your device! Although the forecast in the upper left corner holds true to the current day - not the listed day in the upper right corner (compared to the website) there are major issues regarding everything else. The advance forecast also has trouble updating days (will show current day as Sunday and show the advance forecast as Saturday through Wednesday). Like today, for instance, it shows Sunday's forecast of 3.1, but lists the day as Saturday still, which in turn causes the advance forecast to be completely messed up - ie showing Monday's forecast on Sunday, Tuesday's forecast on Monday, etc (compared to the website to see errors). Functionality fixes would be great, as the mobile version of the site on a mobile browser works very well, but an app that works the same as the site would be much better than having to go to the site. Fairly accurate. Go to FAQ on their website to learn how they estimate pollen forecasts. It's not a 100% science but rather a prediction of the top 3 allergen causing pollens based on past 20 years of data. They also use equipment such as Rotorod samplers to collect pollen in key areas. Many tree pollens can travel by wind great distances... Some up to 50 miles. Check out their website before you give poor ratings due to lack of info. Not sure what the problem was with previous reviewers, which is why I write this for those of you who are interested in this app. This app is accurate in NM which WebMD was not, in fact WebMD was completely off. Registration worked with no problems on an iPhone 6. All well. © 2017 IMS Health Inc.